Stuffing a pizza into your mouth as you hurtle down the highway at 70 mph is never a good look, and possibly illegal, but Domino’s new in-car ordering option could nevertheless prove rather handy if used wisely. That’s right, folks, the pizza giant has just cooked up yet another way of getting pie, and it can all be done in just a few taps. Keen to satisfy the desires of drivers who have a sudden hankering for an Ultimate Pepperoni or Cali Chicken Bacon Ranch, the pizza giant teamed up with vehicle software company Xevo Market on an app that will let you order pie through your car’s infotainment system. Using the in-car touchscreen, the quickest way to get the job done is by selecting the Easy Order option — essentially your default pizza — or your most recent order if it’s something different and you fancy the same again. After that, you just have to decide whether you want to have it delivered to your home after you get back, or if you want to drop by Domino’s to collect it yourself. In the case of the latter, the app can direct you to the relevant Domino’s Pizza in case you’re in an unfamiliar area and you can’t find it yourself. Domino’s new ordering feature will be automatically loaded with millions of cars via the Xevo platform starting in late 2019. “At Domino’s, we want pizza ordering to be simple and always within reach, no matter where a customer happens to be,” Chris Roeser, director of digital experience at Domino’s, said in a release. 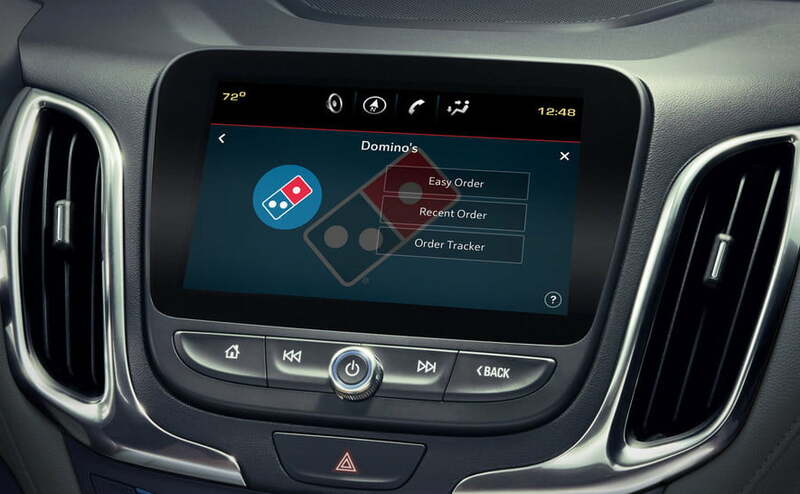 Domino’s aficionados will already have clocked that the new in-car ordering process is part of the pizza company’s AnyWare platform that makes it super-simple to order pizza using a slew of devices and methods. It could be an emoji tweet or a text, or the press of a button on Domino’s Easy Order button. You can ask Alexa, use your smartwatch, or tell your smart TV. Yes, Domino’s appears to be doing everything in its power to prevent you from getting through a whole day without ordering one of its cheese-topped greasy wheels.